Stuffed parathas are healthy and tasty too when compared to plain ones. The stuffing varies from Aloo paratha, Broccoli paratha, Beansprouts paratha, Mooli paratha, Cabbage paratha...etc. The mixed vegetable paratha is a healthy version of stuffed paratha. These are colourful and tasty paratha, best as travel food and also aptly suits kids' or adults' lunch box. This does not require any gravies to pair with as it has inside all the vegetables. 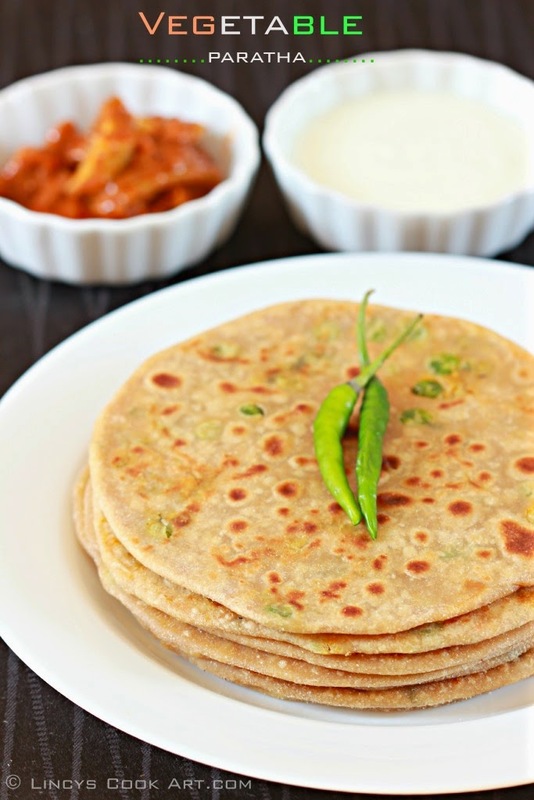 I love this stuffed paratha as it does not require curries and works so easy like one pot meal. Kids too like this because it is a less messy food. Can not prepare food healthier than this in a limited time by incorporating all the veggies. To make the stuffing, heat oil in a pan and fry the cumin seeds. Then add the onion and cook for fifteen seconds till translucent. Add the ginger garlic paste. Cook for further fifteen seconds till the raw smell leaves. Add the beans and peas. Cook with little salt. Sprinkle some water if needed and cook for about a minute. Add the grated carrot and cook for further fifteen seconds. Now add tumeric powder, chilli powder and garam masala powder. Cook for fifteen seconds till the veggies dry without much moisture. Allow the mixture to cool. Mash the masala slightly with the ladle especially peas and make them into 7-8 balls; set aside. To make paratha take atta in a bowl and add the oil and salt. Dry mix with hand and then pour enough water and knead to make a dough. Transfer the dough to the flat surface and knead well for 5 minutes until get soft and pliable dough; set aside for five to 10 minutes to get the dough soften. To make stuffed vegetable paratha, Divide the dough into 7-8 balls. Take one of the ball and spread lightly and keep a vegetable balls inside. Gather the edges together and press well to seal well. Flatten the balls and dust with atta and spread the stuffed balls into parathas. Do not apply much pressure while spreading the parathas. Heat a tawa and sprinkle little oil and cook the parathas on both sides. Serve with pickle or curd. Healthy and tasty paratha........ Looks yummm!! looks tooo good.. lovely and healthy. 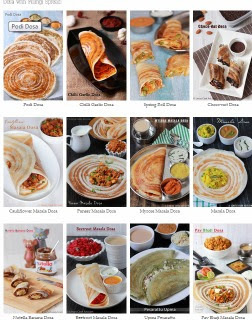 Very different and completely a kids friendy paratha, your clicks are killing me.